My own historical research has revealed that he played a big part in establishing Swifts Boys Club, from which he moved into local politics rising to the honour of being the first Town Mayor after the re-organisation in 1974. However, as he was involved in the formation of the Civic Society and was a member of their first committee, that must have been the basis of an interesting relationship with his Town Clerk, Ken Smale. I first heard of Cliff as the Vice-Chairman of Tewkesbury School Governors before meeting him as a formidable local historian. Cliff became interested in the town after joining Tewkesbury Cricket Club in 1953: it fascinated him to be part of a club more than a century old. Researching its history led him to the old Register Office in High Street, where he was shown the archives - in an old tea chest in the back room! After that he read all he could find on the town, writing various articles, the first one for the old Town Crier, featuring the alleys! The ‘History of the Alleys’ has become synonymous with Cliff’s name and he and photographer George Pearl mounted a road-show that has clocked up sixty presentations. His first publication - for a Dutch publisher - was the second edition of Tewkesbury in Old Picture Postcards, after the original author had passed away. He then published Around Tewkesbury (2001) and The Lost Alleys of Tewkesbury (2004). He also wrote, every year, enjoyable articles for the Tewkesbury Historical Society Bulletins and used his long experience to advise on the re-issue of the Brensham Trilogy and Bennett’s History. The Society remembers him as a witty speaker, whose humour was charmed by the remnants of his Yorkshire brogue. One of his most important challenges was his chairmanship of the Trustees of the Museum, ensuring that the Museum has survived, and he was instrumental in obtaining funding for Chris Kirby, a professional, if part-time, curator. Chris Kirby’s successor, Maggie Wylam, wishes to pay tribute to the support Cliff gave her in gaining qualifications in the museum service. His own words describe the formation of this Society in 1991: "then the great shift, the formation of the Historical Society, I was thrilled to be at the inaugural meeting, and that gave me the impetus to search wider and deeper". We loved working with him over the past 25 years and his frequent memory lapses contributed to our ‘joie de vivre’! The Society decided to create Honorary Life Members of those who have made ‘an outstanding contribution to the study of Local History over many years’. Cliff Burd clearly deserved this honour but an obituary covering just one facet of his extraordinary life in Tewkesbury does not do him justice. 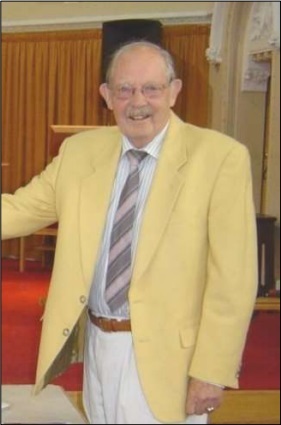 Cliff was taken ill and died in January whilst caring for his wife, Pat; his funeral was a family occasion only. Pat subsequently died in September 2016. We hope that, when his family is ready, we can provide a more comprehensive obituary for a citizen who played such a significant part in Tewkesbury’s own history.